Tracking non-disclosure agreements (NDA’s) are mission critical for organizations who handle sensitive data and intellectual property (IP) as part of delivering service to their customers. Being able to to produce an audit trail demonstrating: who is subject to an NDA, who’s acknowledged and accepted the NDA requirements, and when the NDA has been released, is critical for these organizations who must stay in compliance. Manual processes are time consuming and difficult to manage. ASM International who uses Legal Hold Pro for automating their legal hold processes saw the similarities in two processes and thought it would work to automate NDA’s. 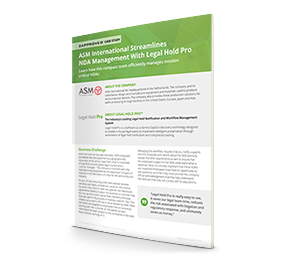 Read the interview with Todd Westersund, Director and Senior Global Legal Counsel at ASM International as he reveals how ASM streamlined management of their mission critical NDA program with Legal Hold Pro.